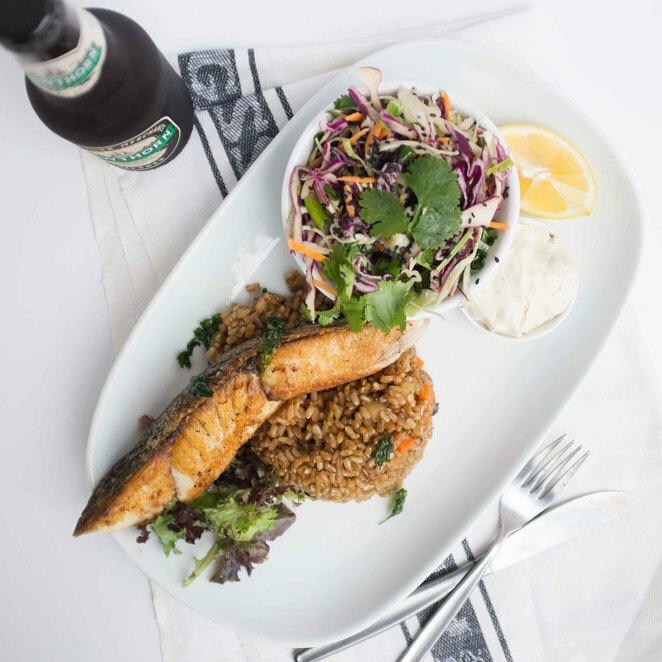 Summer and seafood go hand in hand, especially in the lead-up to the silly season. For city dwellers and workers who just cannot wait until Christmas to dive into summer's freshest catch (myself included), there are plenty of spots around town where you can enjoy an array of fish and shellfish. Best of all, they're all sourced from local waters for optimal freshness. For the lucky few who somehow managed to win big at the poker table (who are you and what is your secret?! ), The Atlantic is the perfect spot to spend your cash. This restaurant's waterfront location and stylish interior sets the scene for a sophisticated fine dining experience, with a menu designed by critically acclaimed chef Donovan Cooke. Cash in your chips, then indulge in a wood fire grilled baby snapper from Port Philip Bay or the popular olive oil confit Ora king salmon with aromatic spice emulsion. There are several Secret Kitchen restaurants in Melbourne, but the flagship restaurant in Chinatown is famously known for its live seafood tank – said to be Melbourne's largest. While punters flock to Secret Kitchen for weekend yum cha sessions and dinners featuring succulent roast meats (including Hong Kong-style goose and suckling pig), we suggest you dip into their range of live seafood options, all locally sourced. Start with some baby abalone perhaps, before working your way to a steamed coral trout with ginger and spring onions done the classic Cantonese way. 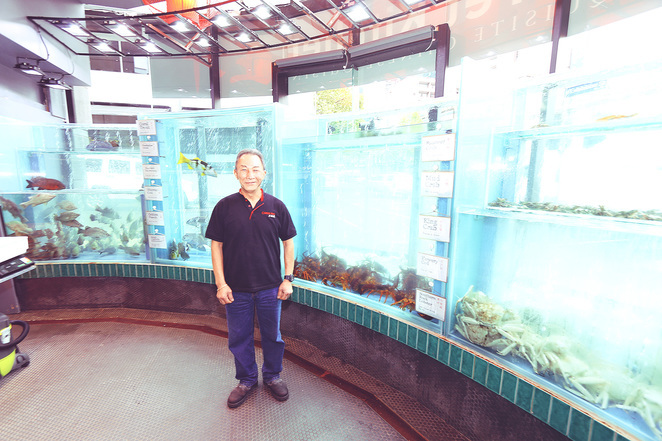 When you walk into Tank, you'll be greeted with polished blue tiles against contrasting white walls and a cabinet display filled with the day's best catch. That's right, folks; Tank is not your typical greasy fish and chip shop. Tank prides itself on sourcing fresh fish from Australian and New Zealand waters, with each fish being neatly labelled so you know that your barramundi is from Cone Bay in WA and that your flathead is from sustainable stock in Lakes Entrance. You can enjoy your fish the way you want it but I like mine lightly grilled and served with seasoned brown rice. Located right next door to Melbourne's iconic Regent Theatre, Box is an ideal venue for those wanting to indulge in a glass of bubbles and seafood before an evening show. A pre-theatre menu gives diners a range of quick options from spicy chilli prawns to seared Moreton Bay bug halves, cooked the way you want it. If you're not in a rush to see a play, I suggest indulging in a Box seafood platter filled with mouth-watering delights from the ocean. 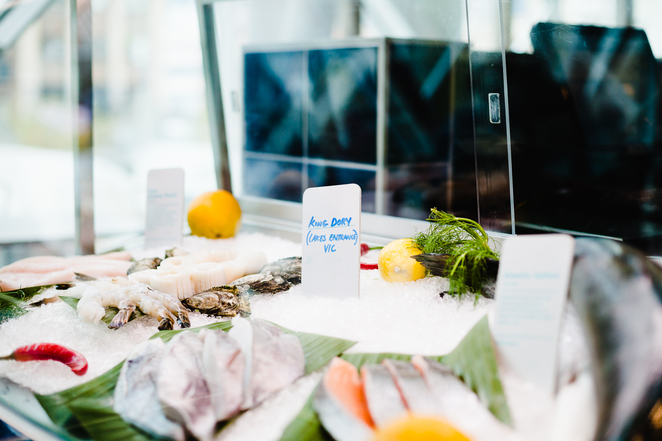 Tucked inside the QV precinct, Meat Fish Wine combines the finest of local produce (from land and sea) with an extensive wine list of over 700 varieties. MFW's seasonally driven menu is modern and fresh, offering diners plenty to choose from whether they opt for a la carte or set menu options. From fresh oysters with Granny Smith and Champagne dressing through to mains such as Hapuka, squid and roasted squid consommé, the hardest bit at MFW is choosing what wine to go with your meal.